OLED (organic light-emitting diode) displays are much more better than typical LCD techs in terms of displaying the ‘true black’. The improved contrast ratio as well as wider viewing angle make them ideal choice for premium smartphones. The research and development of OLED technology is greatly influenced by Samsung. The Korean tech giant had a whopping 98% share of the global AMOLED market (as of 2010). Since the inception of their flagship Galaxy S series, Samsung uses eye-catching ‘Super AMOLED’ display with them. Over the years, the phones become bigger and pack cutting edge hardware components inside them. But 2019 turned out to be different, at least to some extent. 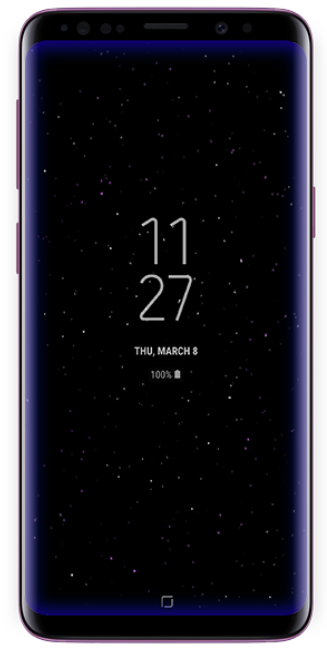 With the tenth generation of Galaxy S phones, Samsung decided to drop the tiny but handy notification LED altogether in favor of AMOLED specific Always on Display (AoD). Features like Edge Lighting and AoD are nothing new, but the user community never think them as the alternative to the notification LED. The trend of smaller bezels and ‘Infinity’ displays effectively compress the region to put sensors and components. Samsung engineers managed to place the proximity and the ambient light sensors behind the display, and this decision helped to start some confusions. In case of the front facing camera(s), Samsung took a bold move and created an engineering excellence. They call it the ‘Infinity-O’ display, where the camera cutout is located on the display panel itself it form of a cutout. The outside perimeter of the cutout will show an animated effect on event like the camera being turned on or the face recognition being done. A Samsung Care Ambassador suggested that Samsung would bring the functionalities of the missing notification LED in form of multiple camera cutout animations via future update. the camera cutout will indeed function as the notification light. It will be automatically colored based on the notification. I, along with a couple other Ambassadors, learned this from a Samsung executive after the Unpacked event in San Francisco. There will be a software update that will enable this on or slightly before launch. Comment from discussion mweinbach’s comment from discussion "Lack of Notification Light". 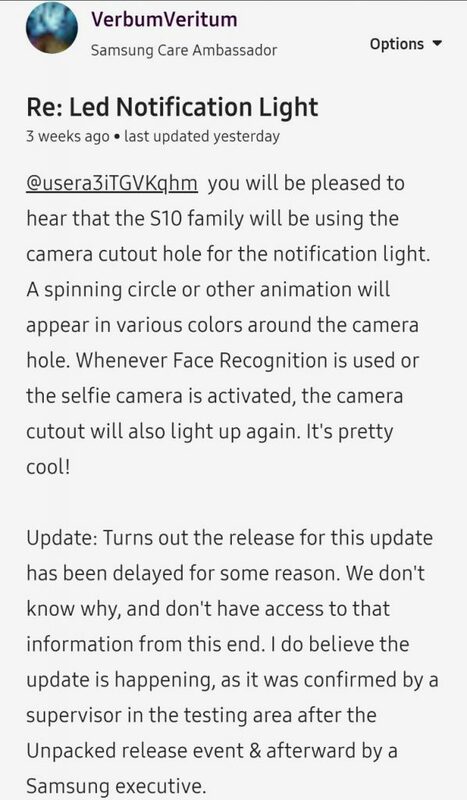 The day-one update, however, did not bring any such feature. 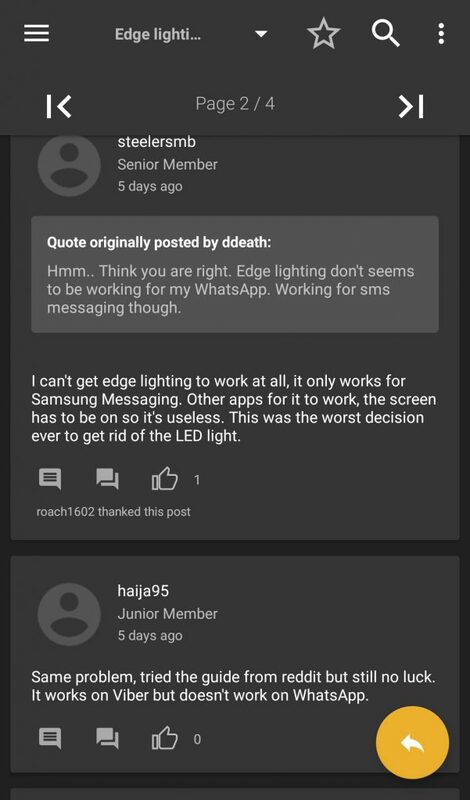 The Edge Lighting feature reportedly not working properly for multiple users. According to observations, Samsung stock apps are working fine, but it’s hit or miss in case of third party apps. 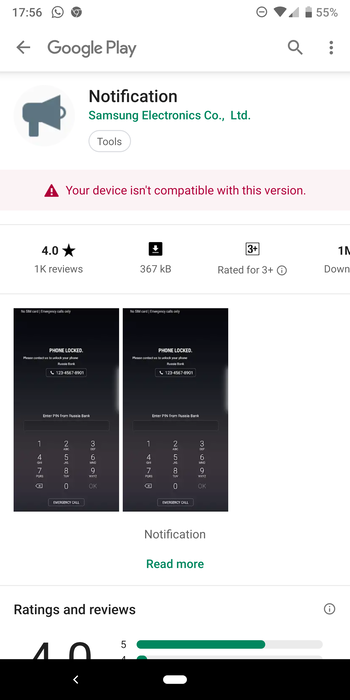 @SamsungMobileUS Edge lighting doesn't work on my S10+, what's up? Frustrated users, who are not accustomed with Always on Display, eventually discovered a third party app named Always On Edge – Edge Lighting. Created by an indie developer, the app is described as “… A RIMIX between Edge Lighting & Notifications & AOD & Live Wallpaper & Edge Mask …”. With the new changes, it effectively works now as an perfect alternative to the notification LED on the Galaxy S10. Users even started sharing their configs so that others can tune the app easily. Update: Turns out the release for this update has been delayed for some reason. We don’t know why, and don’t have access to that information from this end. I do believe the update is happening, as it was confirmed by a supervisor in the testing area after the Unpacked release event & afterward by a Samsung executive. To make things more convoluted, Samsung has recently rolled out an update of a mysterious ‘Notification‘ app for select users. Let it be clear, it is not update the notification LED seekers are waiting for. PiunikaWeb is closely monitoring the situation, so expect more articles from us regarding the Galaxy S10 notification LED fiasco. The latest update of EdgeLighting+, a module of Samsung’s Good Lock suite of apps, enables camera cutout lighting support. Remember that the usual restrictions of Edge Lighting are still present, which means the feature only works if a particular app tries to wake the screen.